I had made New England clam chowder once before in the crock sometime last year. I wanted to give it another try since I not only hadn’t been blogging at the time – doing it again would allow me to take picture and share it, but also so I could make some adjustments. The recipe I used the first time was very basic and quite frankly a total cheater recipe. I hadn’t thought much about that at the time, but looking back I realize just how much of a fake recipe that was. It called for canned everything. I kid you not. I don’t complain about prepackaged ingredients if it’s a few per recipe, but that one called for canned soup, canned cream of this and that. You’d certainly expect the outcome to be at least relatively flavorful since you’re using items that a company has already prepared for you, and it was but it still wasn’t homemade. I get satisfaction out of knowing I can make something myself. I’m not talking milk a cow and make my own cream, or anything along those lines… just making something with a little bit more love. The other downside to that early recipe was the lack of thickness. Clam chowder or at least the New England variety is suppose to be thick and creamy. The other clam chowder some may be familiar with is Manhattan clam chowder, that is not as thick and calls for tomatoes among other things. They have few similarities and in the overall picture are drastically different. 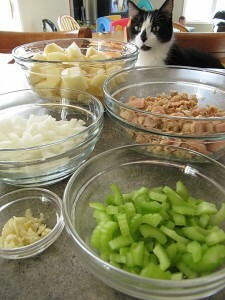 I decided to poke around and get an idea for what recipes were calling for so I could decide my plan of action. Lots of potatoes, veggies and other wonderful flavorings. In the end, this variety not only was much thicker and creamier but it was also mostly much more from scratch… outside of me catching the clams, growing the veggies, making my cream etc. Sure it’s store bought items but they didn’t all come from cans which made me happy. I only share recipes I think are worth sharing and that I think someone else may love but believe me when I say, this is a winner in the world of clam chowder. 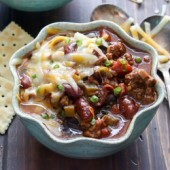 If you are a fan of it, you should definitely try this easy slow cooker recipe. 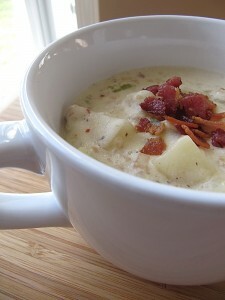 It’s thick and creamy just like New England clam chowder should be and has an wonderful flavor. Not one part is too over powering, everything works just right with eachother. 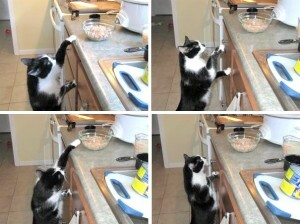 And for those with cats, if you don’t normally have kitchen visitors while cooking… you will while making this. 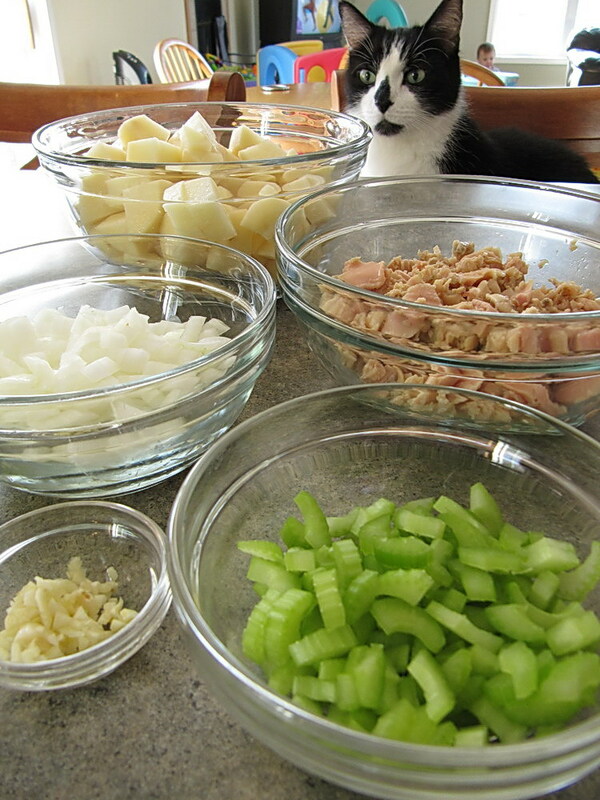 Normally my cat (the one of two that we actually see) doesn’t hang out a ton with me in the kitchen but he was stalking my ingredients the entire time… begging for a taste. It was rather comical. He didn’t even care when our one year old was trying to give him hugs. Prepare onion, celery and garlic. Heat olive oil in a large skillet. Add vegetables, cooking over medium heat until onion is translucent. Add garlic and, thyme and optional red pepper flakes, cooking for an additional 1-2 minutes or until fragrant. Transfer to the bowl of a 6 quart slow cooker. Peel and chop potatoes into small pieces. Add to the slow cooker along with clams, juice and seasonings. Stir to combine. Cover and begin cooking on high for 5 hours or low for 10. Meanwhile, cook bacon in a large skillet over medium heat. Remove 1/2 Tb bacon grease, transfering to the slow cooker, if desired. Chop bacon, reserving a small portion for topping chowder later. Toss remaining larger portion of chopped bacon to the slow cooker. Return lid and continue to cook. When 30 minutes remain in the cook time, add flour to half & half, whisking well until smooth. Add to the slow cooker, stirring wel lto combine. Replace lid and continue to cook until thickened. Divide among bowls serving warm and sprinkling with bacon. 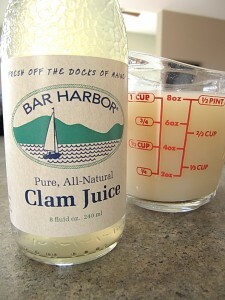 *Use 2 cans of clams drained and 2 undrained or 4 cans of clams drained and 1: 8oz bottle of clam juice. *This recipe has been slightly adjusted from the original to assure better results. Please be sure to follow the recipe accordingly. Also, if this is your first time making this or any other slow cooker recipe, I recommend being home while it cooks so you can monitor it and guarantee desired results. When ddddoyouadd the potatoes? I added them with the clams. Probably a stupid question, but add clam juice in the beginning right? Making it tomorrow night and Hubby is picky about soup. Don’t want to screw this up.!!!! This chowder is absolutely wonderful. I made it according to directions with the exception of using celery. I plan on making this many more times. Bon Appetit! So glad to hear you enjoyed it! Thanks for sharing, Sherrie! I seen someone cook their chowder in a pressure cooker. Since I didn’t have one, I questioned them on other preparation. I googled their answer ‘slow cooker’ and here I am! When I used clams before, they were tough, and I threw them in the last minute. Question I have, is, Are the clams get tender? Thanks for your answer. Pressure cookers and slow cookers aren’t the same and recipes designed for one machine can not be used as is for the other. As far as your tough clam issue goes, that’s typically from over cooking but I’ve never experienced that with this recipe. Good luck! this looks SO good! trying it today, one question..do you not add the half and half until the last 30 min? it seems as though more liquid is needed for cooking it 5 hours? thanks. Correct, it is added at the end of the cook cycle. There should be plenty of liquid to cover the potatoes and other ingredients prior to that. Wow! I wound up chowing down two HUGE bowls so fast that now I feel sick, but it was worth it! Haha, Yum. I added some extra clam juice, some “matchstick” carrots (those thinly sliced ones that are used in salads), and some green onions because I ran out of regular onion. Oh, and an extra can of clams! This will definitely become a staple in my household when the colder weather hits in a couple months. So easy and so delicious! Thanks! Why do you not have a print button? I would like to print this and take it home so I can make it. There is a print button within the recipe section. Been looking for a good thick recipe for a long time with no luck, your’s sounds good. Trying it next week. My family is coming for dinner today, I will let you know how it turned out! Thank you Rachel the recipe for your Clam chowder was s hit! I am new to cooking, but have enjoyed making meals from scratch lately. Would it be feasible to make this recipe from non-canned clam meat? Or would that not work? Or would that be rediculously expensive? Just curious. Looks delicious and I can’t wait to try this recipe! For the amount of clam meat you would need, I wouldn’t recommend it. Not only would it be time consuming, but it would become rather expensive. Thank you so much for this recipe-delicious!!! I will make it often-thank you!! Hi, this was an amazing recipe. My family loved it. I ended up doing a large sweet white onion, and cooked them until they were slightly brown before transferring them to the slow cooker. J also used 4 cans of clams undrained and the bottle of clam juice. It was perfect. Hi! Found this recipe via Yummly and I really want to try it, but was curious how much extra room (if any) you had in your 6 quart slow cooker? Mine is only a 5 quart so I want to adjust (if necessary) before I start prepping, especially because I have a tendency to throw in extra veggies. 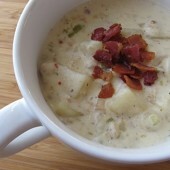 I had been looking for a good slow cooker chowder recipe and came across this via Pinterest. I tweaked things ever-so-slightly (more clams, some shallots instead of all onion) and … yes! This is such a keeper. Great recipe. Perfect thickness. Thanks so much! Is there a difference in taste between using the liquid from canned clams and separate clam juice? I want to duplicate some fabulous clam chowder I had at a small bakery off the NW coast of Oregon. The owner said she used only broth and cream for the liquid, and this recipe looks like a great chance for repeating that creamy fresh flavor. I have trouble patiently stirring and monitoring cream soups on the stove, so I love being able to use the slow cooker. Either should be fine to use. Just have to tell you that my husband said this was as good as what we recently sampled along the coast of Oregon . . .and we live in Indiana! I doubled the recipe for his surprise birthday party and got raves from all. My tweaks were to use half as many potatoes (preferring a higher clam to potato ratio); add shredded carrots, 1 bay leaf, and dried parsley; and to omit thyme (didn’t have any) and red pepper (didn’t want any). Thanks so much! I had never tried making homemade clam chowder. Can chicken broth be added in place of the extra clam juice. Absolutely. 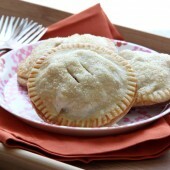 Just keep in mind that this will alter the overall flavor a bit, but you can certainly substitute as needed or desired. I added crab meat and it was great. What is the protocol for freezing the leftovers and thawing to eat later? Typically you want to be cautious freezing anything with a lot of dairy. It should be fine, just be aware that the consistency may change a bit when reheating. 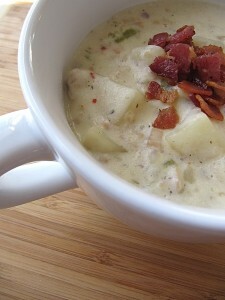 My husband loves clam chowder and I thought I would make this for him. I followed the recipe and it was absolutely wonderful. Would absolutely make it again. Thank you! Half and half is in between milk and heavy cream. It has less fat than cream and more than milk. You could absolutely use heavy cream instead for a richer flavor though. Just made a lovely batch of this, but used a whole Costco can of undrained chopped clams and eliminated the extra 8 oz. clam juice. It was killer! Filled the whole crockpot! Thank you for a really good recipe! So glad you enjoyed it, Sarah!